It would have been much easier if I had had this stroke of genius at the beginning of the year, however, it took my mind some time to wrap my brain around socking away 18,000 dollars!! That’s a lot of cabbage!! I was already contributing 10% but in the last quarter of 2015, I had to up that to 30% to make it work out. My new goal amounted to a few tough months but they were totally worth the sacrifice in the end. With the new challenge, I also began saving more in general. I started unplugging things in the house, I stopped being wasteful of food and other resources, I stopped buying stuff, and in November I opened an investment account with the extra savings. Get an emergency fund together. If you have debt as well as no savings, start small with your savings $50 a month or per paycheck until you reach $2k (I know this is double the Dave Ramsey amount) and put the rest towards debt. Keep this money in a regular bank account or somewhere with easy access should you need it. Don’t worry about the interest rate and do NOT invest it!! 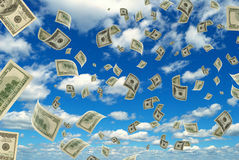 AFTER your debt is gone – I think it is important to have at least 6 months worth of your monthly INCOME stashed away. Not 6 months of living expenses. If you were to lose your job or get hurt, you want to be able to live for 6 months as if nothing has happened to include continuing to build your savings. Contribute to your 401k. If your company offers a 401k and a match, meet their match to 100%. If they don’t offer a match, contribute at least 10% regardless. If you can’t manage 10% start at 5% and work your way up. If no 401k is offered then start an IRA of your own – see #5. If you have debt – start paying it off in earnest. Pay at LEAST the minimum amounts but add every extra bit to get rid of this monkey on your back. If it is a lot of debt, call the credit cards directly and try to negotiate a lower balance. TIP: If they hear you are thinking of transferring your balance after receiving a competitors 0% balance transfer offer, they will play ball so you better learn to catch! 🙂 Once you are done paying them off, try to only buy what you need. I prefer to say don’t use credit, but credit is not a bad thing if you pay it off every month in full. Open an investment account and start to build a nest egg. Start small – $50/month. Invest in low-cost index funds. As I already stated, I am somewhat biased towards Vanguard (VTSMX or VTSAX) but also have accounts with Fidelity, T Rowe Price, and Schwab. Opening these accounts may require a minimum deposit so build it into your savings account until you have enough. Go back to your investment account and save save save!! The thing you shouldn’t do that I fell victim to – individual stocks. There is no point. The index funds will usually outperform in the long run without fear of losing it all. Simplify your investment plan so it can run on autopilot. That’s it! I know it can be overwhelming, especially if you have step #3 to deal with, but it can be done. Just know it will not happen overnight. They say the first million is the hardest – let’s just start with $100. Then $1000, then $10000. You will see how quickly the ball will roll forward. Wow! Great tips you have in here. I often find myself spending my emergency fund and replenishing it afterwards because it’s a bit hard for me to save in small amounts. I only have one bank account so I place everything there. I’ll surely follow your advice.